The "red" cabin at the lower station. Louis Armand and E.A. Martel came down into the unique room of the cave by a 75 meters rope ladder from the small entrance. To facilitate the access of great number of visitors, an inclined tunnel of 200 meters long was pierced. 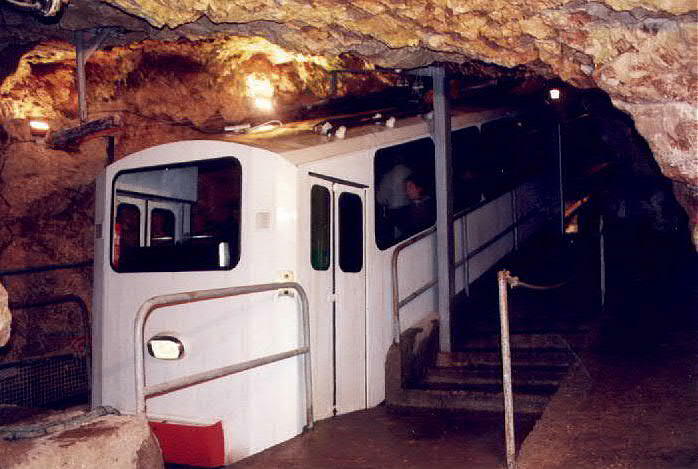 It is only in 1963 that a funicular was installed in the tunnel. Its main special feature is that this funicular has no rails! 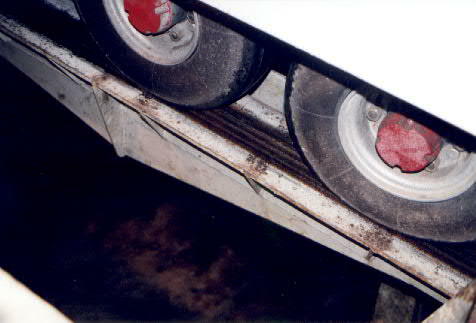 The two cabins are fit with tires which are rolling onto concrete. The reason of this choice seams to be the reduction of the vibrations. The cabins are guided by two parallel trenches into the concrete. Each cabin is following its own trench guided by horizontal tires. C - The trench which guides the cabin with the horizontal tires. D - The cable and the rollers. E - The second trench. How is solved the problem of the siding? You remember that on funicular on rails the cabins are fit with two flat wheels with big width to pass over the gaps of the siding. At the Aven Armand funicular the cabins have eight wheels (four couples) to solve this problem! A couple of wheels allows to pass over the trenches. The concrete caused some trouble to the funicular. In October 1996 some work have been made onto the concrete, but the dimensions have not been well calculated! All the work had to be done again. 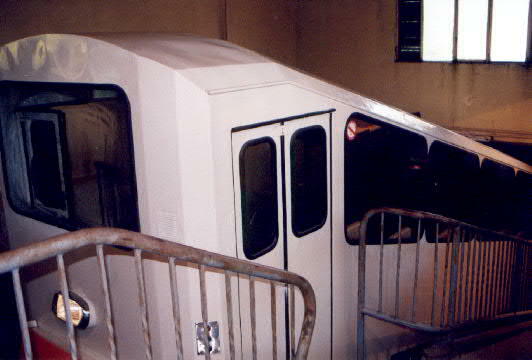 This problem has caused the immobilization of the funicular until the beginning of May 1997! Personally, I have visited Aven Armand the first day of the re-opening!!! The "orange" cabin arriving at the upper station after the visit of the cave. 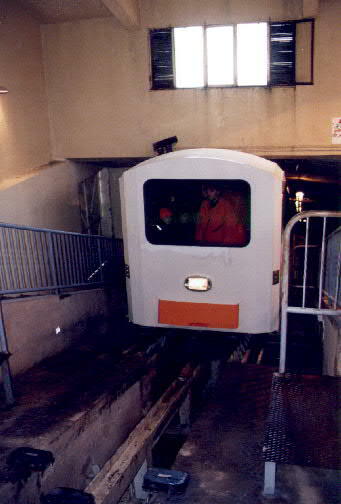 The "orange" car at the upper station. The only difference between the two cabins is the color of the bumpers: red for one cabin and orange for the other one.